Welcome to the new year. May this year bring new happiness, new achievements and a lot of new inspirations in your life. As we reflect back on 2018, we are encouraged that the year to date real estate statistics continue to illustrate the more balanced approach the market has taken. Year to date, residential property transactions total 6,429 v.s. 7,289 for 2017 and 5,809 in 2013. This represents a decrease of 11.8% versus 2017 and an increase of 10.7% versus 2013. Despite the trend of an increase in the average days to sell v.s 2017, it is worth noting that the current average of 38 days to sell is 32.1% lower versus the 56 average days to sell at this time in 2015. The sales price to list price ratio of 97.8% versus 99.1% in 2017 remains relatively steady. Each municipality within our region has variety of unique price and market conditions. 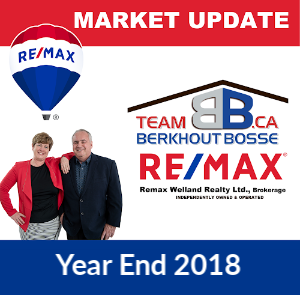 Please keep in mind that we are always here to help you interpret the data and connect you with our Team Berkhout Bosse network of community partners.